I had just visited my chirporactor in Raffles Place and decided to swing by this restaurant in Marina Bay Link Mall with my husband. Yomenya Goemon is an interesting place. 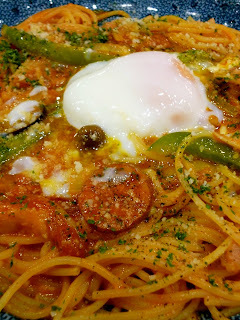 It's a Japanese restaurant that serves only spaghetti/ pasta dishes. It's not a fusion restaurant, but instead you can say it's Japan's interpretation of italian spaghetti. They have 32 different pasta dishes ranging from aglio olio (olive oil and garlic), tomato, and cream base. Most pasta dishes cost SGD 12.90 each and the serving portions are quite hefty. So you will probably spend from SGD 15 to 20 per person if you want to add on drinks or a salad. I had the Napolitean pasta with mozarella and sausage (SGD 12.90). Pasta was cooked perfectly al dente. The sauce was a little on the sweet side but still very good. The poached egg in the middle of the spaghetti was an interesting touch, but it made my pasta a bit too heavy. My husband had the Basil and Fresh Mozarella (SGD 12.90). He thought it was very good too, and the pasta had some yummy mozarella chunks. The tomato sauce was also very fresh. Overall I would recommend Yomenya Goemon if you are looking for a unique pasta experience. Service was also fast and efficient, so those working in the Raffles area could go here for a quick lunch.